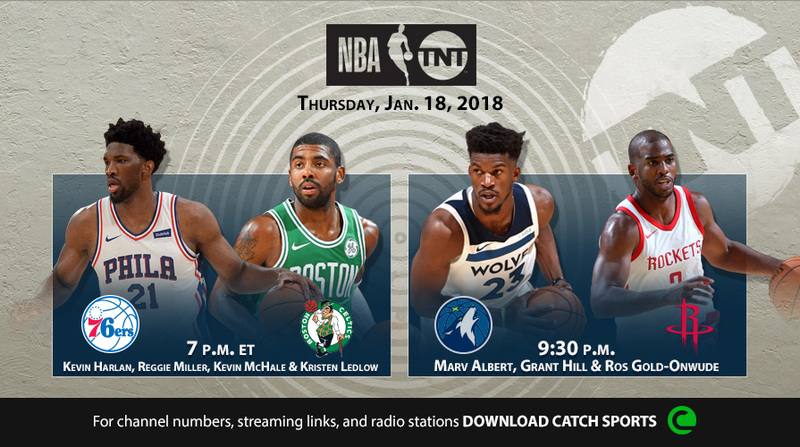 TNT NBA Tip-Off presented by Autotrader on Thursday, Jan. 18, at 6 p.m.
TNT – the exclusive home for extensive live coverage of NBA All-Star 2018 in Los Angeles – will reveal the All-Star Game starters, captains, reserves and newly formatted teams over a series of three nights during its TNT NBA Tip-Off presented by Autotrader pregame coverage starting Thursday, Jan. 18. On Thursday, Jan. 18, at 6 p.m. ET, the Sports Emmy Award-winning studio crew of Ernie Johnson, Charles Barkley, Shaquille O’Neal and Kenny Smith will unveil the All-Star Game starters, including the two captains, prior to TNT’s doubleheader coverage featuring the Philadelphia 76ers at Boston Celtics at 7 p.m., and Minnesota Timberwolves at Houston Rockets at 9:30 p.m. The network’s Players Only crew of Chris Webber, O’Neal, Isiah Thomas and Baron Davis will announce the reserves, as selected by NBA head coaches, on Tuesday, Jan. 23, at 7 p.m., prior to the Miami Heat at Rockets at 8 p.m., and Timberwolves at LA Clippers at 10:30 p.m. The newly formatted team rosters – selected by the All-Star starter from each conference who receives the most fan votes – will be revealed on Thursday, Jan. 25, during a one-hour edition of TNT NBA Tip-Off at 7 p.m. with Johnson, Barkley, O’Neal and Smith. Later that night, the network will feature the Washington Wizards at Oklahoma City Thunder at 8 p.m., followed by the Timberwolves at Golden State Warriors at 10:30 p.m. The 67th All-Star Game will be played at Staples Center in Los Angeles on Sunday, Feb. 18, at 8 p.m. on TNT.